Take potatoes. Wash it thoroughly, pierce with fork, sprinkle salt and bake it in the microwave for 6-7 minutes. Turn and bake it for another 2-3 minutes. To check it if it is done, pierce fork/knife into the potato, if it goes in smoothly then it is done. Let it cool. Peeling the skin is optional. You can have it with the skin also. While potatoes are being baked, prepare tomato sauce. Cut all the vegetables, add salt, oregano and mix it well. 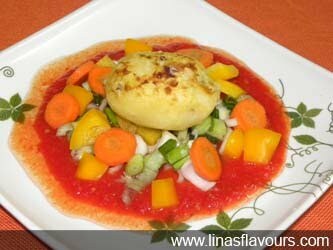 For serving pour tomato sauce, sprinkle vegetables and finally put baked potatoes. If you like then pour more tomato sauce on the top and relish the dish. If you like you can bake the vegetables also.